The potential distributions measured on the human torso surface are caused by the electrophysiological activity of the heart. Given a computer model of the body anatomical structures and their physiological properties, it is possible to simulate corresponding body surface potential maps (BSPM). In this way the forward problem of electrocardiography is formulated. Solving the forward problem and comparing the results with measured BSPMs enables a researcher to optimize the model parameters in a patient-specific manner. The aim of solving the inverse problem of electrocardiography is to reconstruct the heart activity from a given set of BSPMs. This problem is ill-posed, i.e. its solution is highly unstable with respect to measurement erorrs and noise. In order to stabilize the solution a mathematical technique, called regularization, is employed. 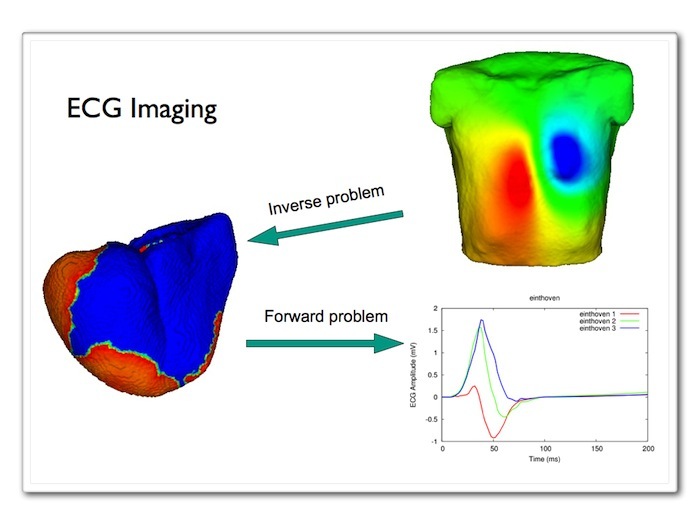 The solution of the inverse problem provides the researcher with detailed information about the electrophysiological heart activity of a patient, thus making it a powerful tool for clinical diagnosis. O. Skipa, Linear Inverse Problem of Elecktrocardiography:Epicardial Potentials and Transmembrane Voltages. PhD thesis, IBT, Universität Karlsruhe (TH), 2004. D. Farina, Forward and Inverse Problem of Electrocardiography: Clinical Investigations. PhD thesis, IBT, Universität Karlsruhe (TH), 2008. Y. Jiang, Solving the Inverse Problem of Electrocardiography in a Realistic Environment. PhD thesis, IBT, KIT, 2010.